Hope you all had a good Easter, I enjoyed a technology free time. It snowed here yesterday! Made me glad to be in and for the first time in a long time I have managed a finish. Last night I needed to sew. I'm trying out different size squares to see what would look better for a future project. 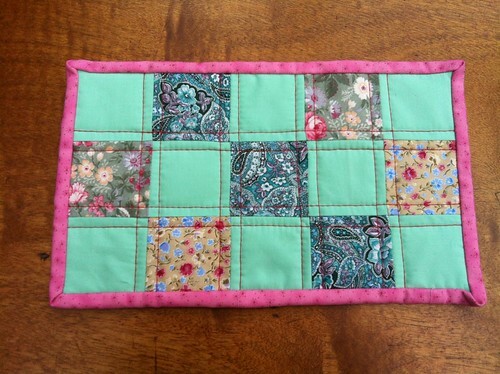 So last night I made mug rug with 2 1/2 inch squares (thank you Sizzix Big Shot). I think it turned out ok. It was nice to have it totally done before I went to bed. Last week I was also inspired by this to try some improv piecing, I wasn't sure if I would like it as I really tried to copy the "pick without looking" method. Another not too shabby piece of work. 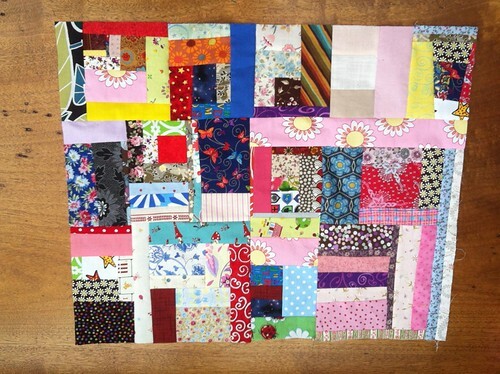 I looked back at the first issue of Fat Quarterly and found a finish for this block (really wide border) which I'm going to do when I hit my target size. Best bit about all of this is all the fabric is from my scrap boxes! Nice to be inside and warm and sewing when outside's not quite so pleasant! Well done on using up some scraps!